Quirky News | Orange UK. A tire company says it’s new invention could put an end to frustrating slow punctures and dangerous high-speed blow-outs. 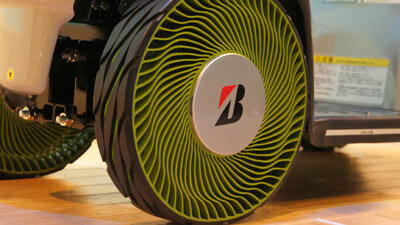 Bridgestone says its groundbreaking new prototype airless tirenever goes flat. It is made of a recyclable plastic resin weaved into a mesh of spokes to support the tread of the tire. The flexible design plays a key part in assuring the tire does not collapse – performing the function air pressure does in regular tires. According to Bridgestone, the ‘non-pneumatic’ tire is at an early stage of development but should eventually be available in retail vehicles. A Bridgestone spokesman said: “There is no need to periodically refill the tires with air, meaning they require less maintenance. “At the same the worry of punctures is eliminated. Non-pneumatic tires have less impact on the environment than today’s conventional tires.